The US revoked the duties on glossy paper from Canada in part due to the WTO ruling in favour of Canada. In related news: the Governor of Arkansas is seeking tariff exemptions on plans for a Chinese-owned paper mill in the state; and Senate Minority Leader Schumer says Canadian newsprint tariffs should be rescinded. In Forestry news: academics ciritcize vitriolic attacks on Caribou protection plans; ENGOs say old-growth logging threatens BC’s orca rubbing beaches; the TLA says transition to second growth could take 90 years; and Tom Fletcher writes on industry concerns with the BC’s professional reliance review, while Resource Works comments on the author’s many conflicts of interest. Finally, thousands of Atlantic Canada residents protest Northern Pulp mill’s effluent plans. MONTRÉAL – Resolute Forest Products Inc. is pleased to announce that the United States Department of Commerce is formally revoking the countervailing duty order on supercalendered paper from Canada, retroactive to August 3, 2015. Collection of cash deposits on imports of SC paper from Canada will cease, and all cash deposits that have been collected from importers of record since August 3, 2015, will be returned with interest. Resolute’s cash deposits as of June 30, 2018, total $60 million. The company will also receive accumulated interest on these deposits. The precise timing of the refund will be set out in a Federal Register Notice to be published in the upcoming days. Revocation of the countervailing duty order is pursuant to issuance today of a final determination in the Changed Circumstances Review that the Department initiated on May 14, 2018. U.S. Senate Minority Leader Charles Schumer of New York this week called on the Trump administration to rescind duties on imported Canadian newsprint, which he said harm printers and newspapers across the state. Newsprint prices have climbed 24 percent to 28 percent since last year in response to preliminary duties that the U.S. Department of Commerce placed on Canadian groundwood paper in January, Schumer said. Groundwood paper is primarily used as newsprint. …Several newspaper publishers have told Schumer the higher prices could result in job cutbacks or reduced page counts, he said in a news release. The newspaper industry employs about 17,000 people in New York, Schumer said at the Quad Graphics event, according to news reports. United by a widespread fear that the Northumberland Strait is imperilled by a pulp mill’s developing plans to discharge liquid waste into its waters, residents of three provinces numbering in the thousands rallied Friday in Pictou, N.S. Known for its rich maritime history and cottage appeal, the picturesque town on the province’s north central coast has caught many a tourist by surprise, not just for its beauty, but for the stink that often pervades it. …Locals have waged a five-decade battle with the mill’s owners to keep its emissions in check. …Friday’s rally was peaceful and featured a flotilla of more than 150 fishing boats loaded with supporters who clogged Pictou’s harbour after conducting a sail-by of the Northern Pulp mill with air horns blaring for effect. Dozens of fishing boats steamed towards a hulking pulp mill in northern Nova Scotia on Friday, marking the climax of a boisterous demonstration that saw more than 1,000 protesters call on the mill’s owners to scuttle a plan to dump millions of litres of effluent a day into the Northumberland Strait. Chanting “No pipe, no way!” a long line of marchers streamed onto the pier of a sun-drenched marina in Pictou, which is directly across the town’s harbour from the massive Northern Pulp mill. A fishermen’s group estimated that about 200 boats were part of the flotilla that sailed into the breezy, choppy harbour around 1 p.m., then circled back to the marina as a protest rally got underway. …After years of pumping 70 million litres of treated wastewater daily into lagoons on the edge of the nearby Pictou Landing First Nation reserve, Northern Pulp wants to dump it directly into the strait. 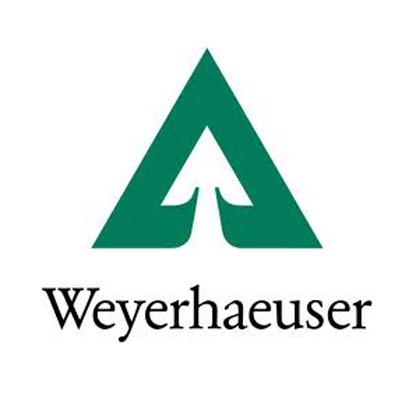 MARTIN COUNTY, N.C. – It took fire crews from five fire departments nearly five hours to extinguish a fire at the Weyerhaeuser plant in Martin County. Jamesville Fire Chief Michael Pierce says the fire started around 3:30 in the planer side of the building and made it to the bag house. He says there was extensive damage, estimating the loss at around $25,000. Nancy Thompson with Weyerhaeuser media relations says that the fire was a minor event and that there were no injuries. She did not have an assessment of damage available. Hanoi – Forestry posted the highest trade surplus, at 3.23 billion USD, amongst agricultural sectors in the first half of 2018, according to the Vietnam Administration of Forestry (VNForest). VNForest also reported that more than 4.33 billion USD worth of forestry products were shipped abroad between January and June, up 12.7 percent year-on-year. Deputy Minister of Agriculture and Rural Development Ha Cong Tuan said the forestry sector has sustained the growth achievements set in previous years, adding that VNForest looks likely to maintain this trend to obtain this year’s targets. …Tuan said the wood and forestry processing industry is developing strongly. 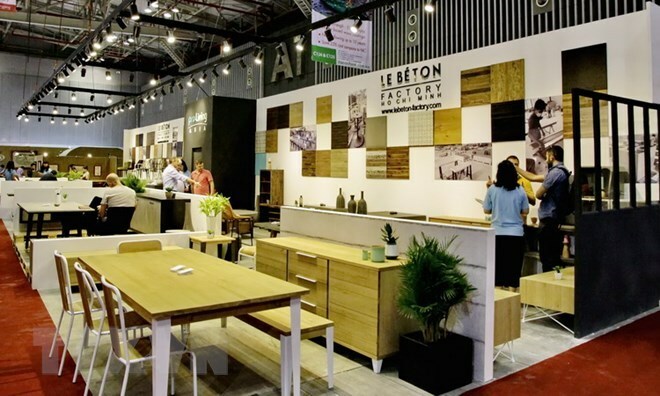 Vietnamese wood products have been exported to over 100 countries and territories with major markets being the US, Europe, Japan, the Republic of Korea, and China. 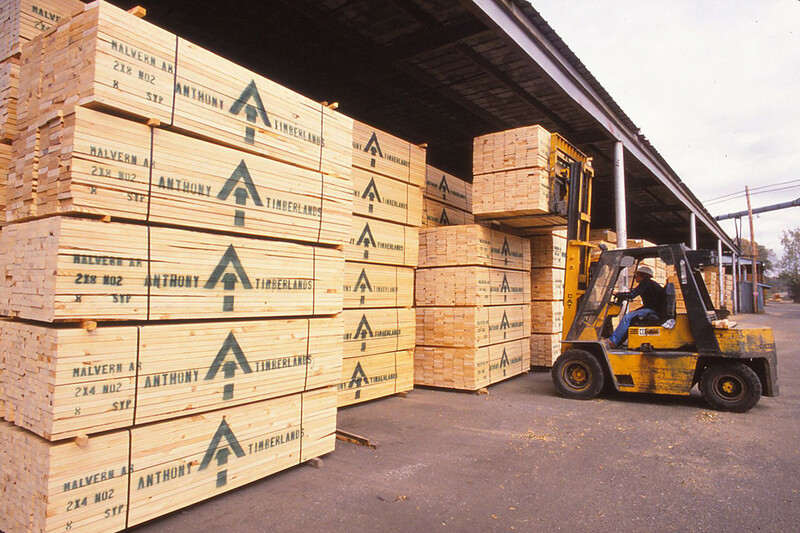 As the market continues to appreciate the advantages of building with wood, extending the service life of wood products has become an ongoing need. Understanding the biodegradation of wood and the detoxification of wood preservatives by microorganisms can help in the development of innovations that not only prolong the life of wood products, but may also increase market competitiveness. The Sustainable Construction – New Construction Materials team at FPInnovations has harnessed the power of genomics and has expanded their laboratory capacities to do more in-depth examinations of the role that bacteria plays on the decay of wood and the detoxification of preservatives. Angela Dale, Scientist at FPInnovations, has been using genomics over the past two years to identify and understand the community of fungi and bacteria associated with treated wood. In 2016, under FPInnovations’ Indigenous forest sector support program, a participatory housing pilot project was initiated with collaboration between the Heiltsuk First Nation, FPInnovations, and the University of British Columbia (UBC). The housing project was created to help address the urgent housing shortage issue in Bella Bella – a small town located on the central coast of British Columbia where over half of the Heiltsuk Nation’s 2,400-member population resides. …To address the urgent housing shortage issue, the Heiltsuk Tribal Council has partnered with FPInnovations, the School of Architecture and Landscape Architecture and the Faculty of Forestry at the UBC as well as with Mitacs. The main objective of the housing project was to explore timber-framed housing options for their newly created 46-lot subdivision in Bella Bella. 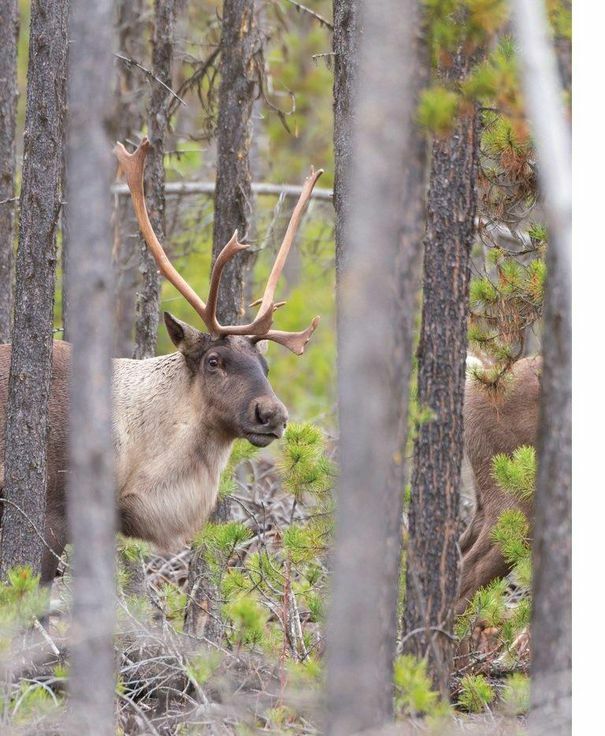 Boreal caribou are rapidly dwindling in Canada. It’s critical that we protect their habitat. Scientists have been tracking the decline of boreal caribou in Canada for decades. …So, it is heartbreaking to see caribou endure prolonged political inaction despite overwhelming scientific evidence that decisive action is needed to protect the at-risk species and its habitat. This year alone, the Quebec government announced it will not be taking action… the Government of Alberta gave the federal government notice that it will suspend portions of its caribou protection plan… and the Government of Ontario extended the forestry industry’s regulatory exemption from the Endangered Species Act. 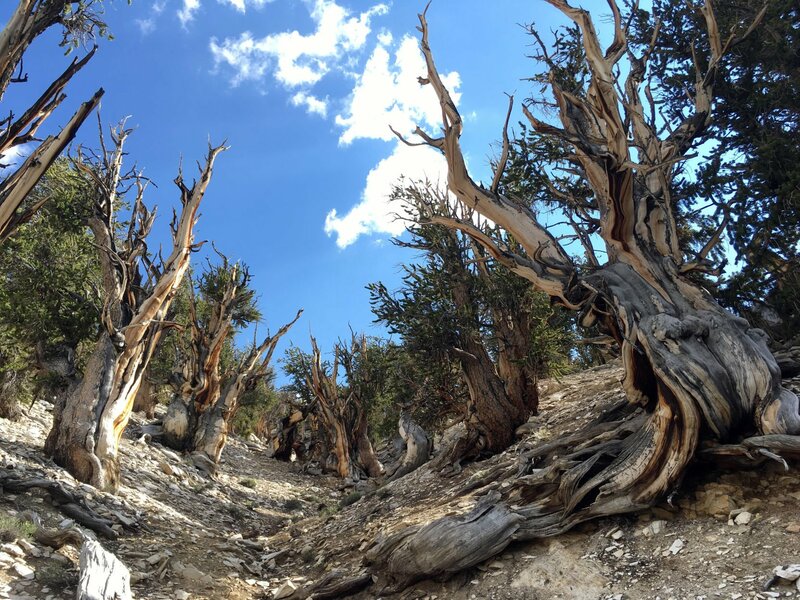 …Opinions being disseminated by several industry associations, politicians and forest companies, particularly in their communications to forestry-dependent communities, appeared to be using the same misinformation tactics used in climate change denial. 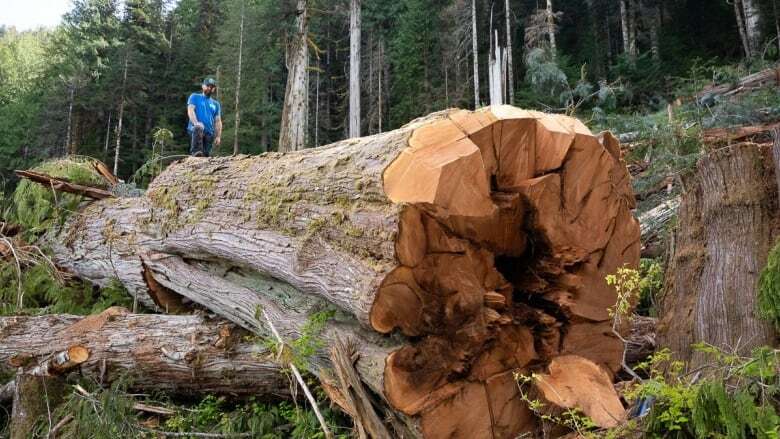 …David Elstone is the executive director of B.C.’s Truck Loggers Association (TLA)… Many of its members are contracted to log portions of the province’s remaining old-growth forests each year. …But according to the TLA, a moratorium on old-growth logging would have a severe economic impact on B.C.’s forestry sector. …The TLA believes loggers will eventually have to transition to only harvesting second-growth forests… But old-growth products are currently far more valuable on the free market compared to their second-growth counterparts, due largely to their strength, durability and appearance. …According to the TLA, transitioning to a complete second-growth harvest should take 90 years in order to minimize the economic impact on the industry and communities. …But many environmentalists think the transition should happen a lot sooner. Last week, 223 international scientists signed a letter urging the B.C. government to take greater responsibility for the remaining old-growth rainforest in the province. The province of British Columbia’s review of professional reliance in natural resource decision-making was released last week with 121 recommendations aimed at 51,000 professionals in engineering, geoscience, forestry, biology, agrology and applied science. …The review findings immediately provoked strong criticism from mining, forestry and business groups. Little wonder. In the first place, the process was spearheaded by environmental lobbyist Mark Haddock, a UVic academic with strong ties to the environment minister, George Heyman. …He is tied to West Coast Environmental Law, which is concurrently advocating for “a complete overhaul of BC’s environmental assessment law.” …The province of BC could not possibly have believed that, with his appointment, a neutral arbitrator was being put in charge of the review process. …If that obvious conflict of interest is not compelling enough, consider that Haddock is also an alumnus of Ecojustice, an advocacy group that is in the business of suing Canadian governments on environmental issues. Industry associations have warned that the B.C. government’s move to overhaul its environmental oversight of industrial projects is a move towards over-regulation. Environment Minister George Heyman ordered a study last year, as required by its minority government agreement with of the B.C. Green Party, to “review and address failures in the professional reliance model in B.C. so that British Columbians’ faith in resource development can be restored.” Professional reliance is a policy of requiring mining, forest, petroleum and other industrial companies to produce their own environmental studies on proposed projects, rather than have government experts conduct studies. Professional associations for biologists, foresters, engineers and other fields were given responsibility for codes of ethics and discipline of members. The report by University of Victoria environmental law professor Mark Haddock recommends the province establish a new “office of professional regulation and oversight” to work independently of resource ministries. Four years after its inception the City of Williams Lake and Williams Lake Indian Band have profited for the first time from their joint Community Forest Agreement Tenure. In June the City received a cheque in the amount of $987,000 and the WLIB received $861,000. Steve Capling, Community Forest board chair, said the cheques covered both a dividend and a repayment of previous loans and costs associated with setting up the Community Forest. At its regular meeting on June 26, city council passed a motion asking staff to put the money into a reserve fund and bring forward a report on how it can be managed in the future. “The idea is to have it earmarked so that it doesn’t just end up in general revenue without being able to identify the projects that it goes toward,” Mayor Walt Cobb said. A deal between a group of First Nations and a paper company in The Pas will give Indigenous Peoples more say on timber harvesting on traditional First Nations land, and boost the number of Indigenous forestry contractors. Canadian Kraft Paper and Nekoté, a corporation that represents seven area First Nations, partnered to create the Nisokapawino Forestry Management Corp. “Nisokapawino” means “two standing together” in Cree. The partnership was finalized Friday in The Pas, where the paper mill is the largest employer. It directly employs more than 300 people, plus harvesters and service providers. The new corporation will co-manage nearly 21.5 million acres of boreal forest where the mill sources its lumber. It includes the traditional territory of nine First Nations. Robson Bight may be the world’s most famous orca sanctuary. Orcas have visited the beaches of the small bay located on Vancouver Island’s northeast coast between Port McNeill and Sayward for perhaps thousands of years to rub their bodies against the smooth pebbles of its shores. But ecologists and at least one Indigenous chief say that logging in a nearby old-growth forest could destroy those “rubbing beaches,” dealing a significant blow to a population that’s already threatened. The major fear among ecologists — denied by the province and a coalition of area Indigenous groups — is that logging operations will destabilize the hillsides, especially during periods of heavy rainfall, resulting in landslides of debris into Johnstone Strait. “My concern is that it’s a very steep slope, and I think that it could very well suffer from a landslide,” said longtime whale researcher and ecologist Paul Spong. 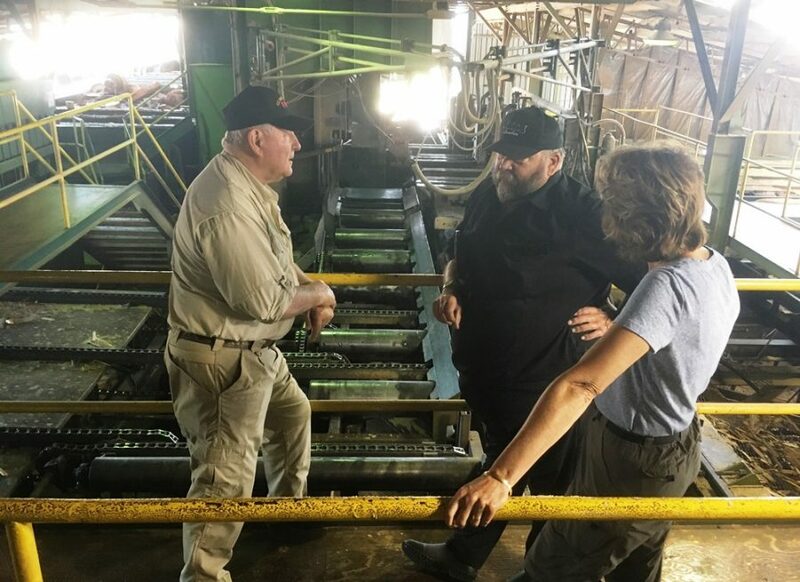 U.S. Secretary of Agriculture Sonny Perdue made his first visit to Southeast Alaska on Thursday. Perdue spent Thursday morning in Ketchikan, and met with U.S. Forest Service officials, but spent most of the day on Prince of Wales Island. Perdue was joined by Alaska Sen. Lisa Murkowski a little after noon on POW. They first met with the Prince of Wales Landscape Assessment Team. That group includes diverse stakeholders who provided recommendations for managing Prince of Wales Island forests for the next 10 to 15 years. The visiting officials also toured Viking Lumber mill in Klawock, and talked at length with co-owner Kirk Dahlstrom; toured young- and old-growth timber stands; and visited Goose Creek mills near Thorne Bay. Perdue said he is impressed with how many resources the Tongass National Forest provides. After visiting timber industry sites in Southeast Alaska on Thursday, U.S. Department of Agriculture Secretary Sonny Perdue said he’d like to alter federal law to allow more logging in the Tongass National Forest. Perdue, the highest ranking official at the agency overseeing the U.S. Forest Service, toured logging companies and two timber stands on Thursday at the invitation of U.S. Senator Lisa Murkowski. He told reporters afterward he hopes to develop an “Alaska-specific” version of the 2001 roadless rule, which bans logging and road building on national forest lands where roads have not been built. The rule applies to 50 million acres in the Tongass. The State of Alaska has tried for years to secure an exemption to the rule in federal courts. The U.S. District Court of the District of Columbia shot down those efforts last year. CACHE CREEK, B.C.— Communities are still recovering from British Columbia’s worst wildfire season on record, one year after a fateful two-day period in July 2017 that sparked more than 100 fires and prompted the province to declare a state of emergency. Cache Creek Mayor John Ranta remembers a fire breaking out on July 6 near the Ashcroft First Nation and sweeping across the countryside the following day, as strong winds propelled it from the horizon to directly opposite the village office in about 20 minutes. 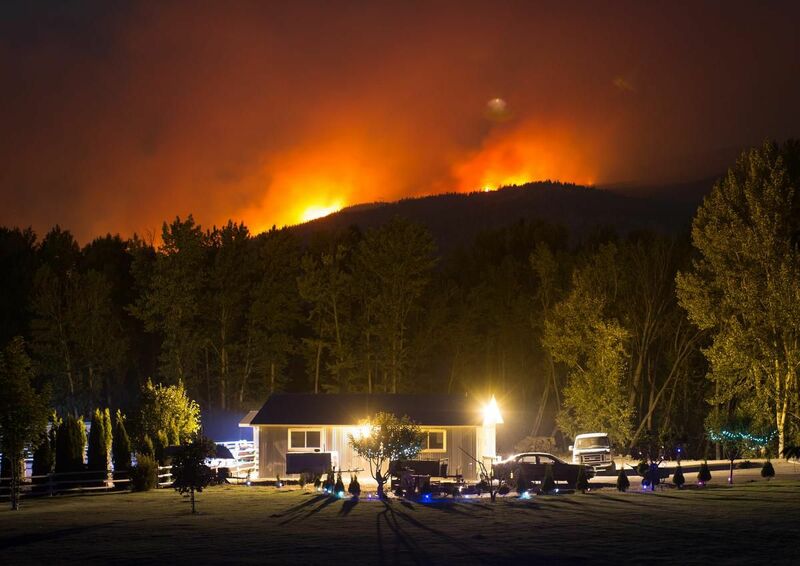 …It was the beginning of a devastating wildfire season that ultimately forced 65,000 people from their homes, burned a record-setting 12,000 square kilometres of land and kept the province under a state of emergency for 10 weeks. Premier John Horgan said the anniversary was a time to remember that B.C. residents will always be there for each other in times of need. On July 8, 2018 members of the Temiskaming Detachment of the Ontario Provincial Police assisted the Ministry of Natural Resources and Forestry by advising residents living between Finlayson Point Provincial Park Road and Jessie Lake to evacuate their homes due to a dangerously close active forest fire near Temagami, Ontario. The MNRF has implemented this mandatory evacuation and there are approximately 20 homes in this area. Members of the public have been asked to leave their residence immediately and travel northbound on Highway 11, away from the active fires. 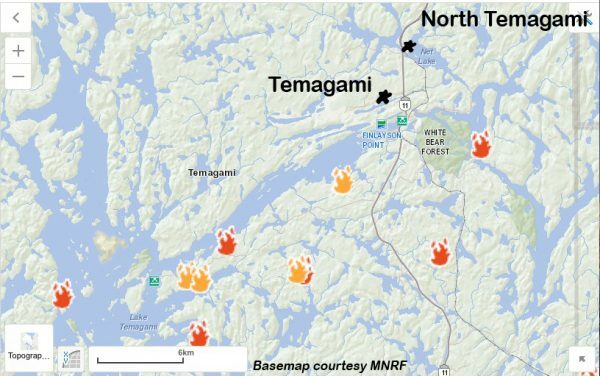 Residents living in the area between Jessie Lake and the Lake Temagami Access Road have been placed on “alert” … Those residents residing in the Town of Temagami are currently on a voluntary notice to evacuate and are also being asked to travel northbound on Highway 11 if they choose to leave at this time. The Society for Protection Against Forest Fires (SOPFEU), in collaboration with the Ministry of Forestry, Wildlife and Parks, has been sent support from the Province of Saskatchewan and Parks Canada to battle forest fires in Quebec. The additional loans brought the total number of firefighters to 205 brought to Quebec from across Canada and northeastern U.S. …The reinforcement was deployed to fight active fires as well as help prevent ignition due to seasonal storm conditions. At the time of report, there were 61 forest fires in Quebec, 31 of which were in intensive protection zones. …A spokesperson for the fire protection service says there have been 357 fires in the province so far this year, up from an average of 276. 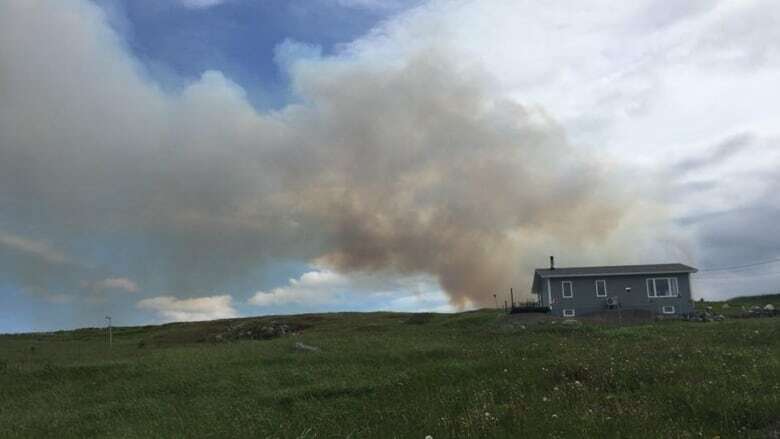 Crews battling a forest fire near Grates Cove and Daniel’s Cove on the Avalon Peninsula say the fire has been contained, with four firefighters on the ground and a waterbomber and helicopter helping from above. Jeffy Motty, a forest protection officer with the Department of Fisheries and Land Resources, told CBC News that as of Sunday morning, the forest fire was 75 per cent contained. He said the size of the blaze remains the same at three kilometres long and 0.5 of a kilometre wide. Into the third day of burning, Motty said four personnel are working on the ground with two pumper trucks, a waterbomber and a helicopter assisting. After people were told to evacuate cabins near Daniel’s Cove Friday night, Motty said the danger to cabins in that area had decreased. LOS ANGELES — Firefighters toiled in stifling heat Saturday on the lines of destructive wildfires across the U.S. West, making progress against some blazes while struggling to tame others that have forced evacuations of hundreds of homes. In heat-stricken Southern California, powerful winds that sent an overnight inferno hopscotching through the Santa Barbara County community of Goleta vanished in the morning, allowing firefighters to extinguish smoldering ruins of an estimated 20 structures, including homes. Authorities announced that mandatory evacuation orders were being greatly reduced and many of the 2,500 people who fled Friday night would be able to return home by late afternoon. County Fire Chief Eric Peterson thanked residents for heeding the call to evacuate, allowing firefighters to focus on fire suppression rather than rescues. “There very likely would have been fatalities last night had those evacuations not occurred,” Peterson said.